Yesterday I was talking to my girlfriend about Organic Veggies and Fruits and it occurred to me that some people are seriously being duped into buying produce that is not organic, and is even GMO sometimes. So here’s a quick guide to help you “see” what you’re buying. When purchasing produce always always ALWAYS check the PLU code. 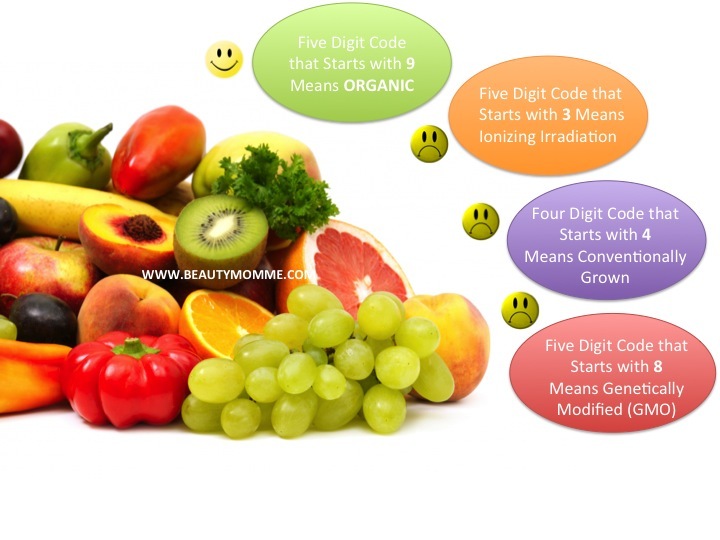 The PLU code will tell you if a fruit or veggie is 1) organic, 2) conventionally grown, 3) Genetically Modified (GMO), or 4) Ionizing Irradiation. Go to a farmers market? There are many vendors at a farmers market that are also not organic. Although the farmers market carry many local farmers (which are always great to support) not all of the farmers there are organic. The food offered there is either conventionally grown, spray & pesticide free, or organic. The only way to purchase genuinely organic produce from a farmers market is if it has a seal that says Organic. This means that the farmer hired a third party to inspect the farming methods at the farm to ensure that the produce provided is in fact organic. Shop at “natural” stores like Whole Foods and/or Trader Joe’s?? Check the label. Not all the produce sold there is organic. (Sad but true). Luckily it is all labeled. Even the signs in those stores will tell you whether it’s organic or not. BUT still check the label because human error can creep up and you’ll find some of the non-organic produce in the bin labeled organic. Just look for that 9!! !